When I awoke early this Monday morning to a tweet from a cycling friend in Indiana with the simple words, "Looks like you were right all along." My first reaction was, I don't like when I am right. What has happened now? 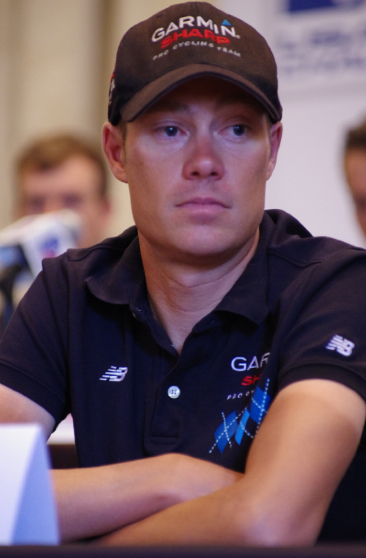 Tom Danielson: A Sample, positive for synthetic testosterone. Cannondale-Garmin: NOT CLEAN. How surprising - not at all. How tragic - yes. For Tom - who cares. Tragic not because we actually believed doping had exited out the front door of pro cycling (while partially returning through the back door). Not tragic because we believed that Tom Danielson - via continued high salary and stage wins - had seen the light, was suddenly a changed man and no longer doping. Tragic because today's breaking news of Danielson's positive doping test represents the reputation of a team. THE team which based its entire premise on racing clean. Truth #1: We might think of Italian Danelo Di Luca as the lowliest of doping slime but he didn't bring down his team with him. Can we isolate the slime of Tom Danielson from his entire "clean" team? Sports fans tend to think of the team unit as winning or loosing. It took lots of work by journalists and lawyers to convince the fans that Tom Brady's deflategate did not reflect upon the integrity of his entire New England Patriots football team. In the sport of professional cycling, journalists and public relations staff work very effectively to isolate a rider kicked to the curb for doping, without taking down his entire team, and thus the sport. Any team wants to distance themselves fast from a dirty athlete. Truth #2: The Argyle bravado was doomed to fail. Team Cannondale-Garmin is different than other World Tour teams. Every rider on the team represents the standard of the Argyle brigade. The team has vocally built their business model on the premise of being clean. A stance that in a way said arrogantly, we are better than the rest, we are right, we are the strong against the weak of character. When the righteous fall and appear wrong, the ripple is great. There is no way an entire team can be clean, it was a house of cards waiting to crumble. Truth #3: People you like dope. Doping exists in cycling. Doping continues in World Tour, Pro-Continental, Continental, National, State, Collegiate, Amateur and Club Cycling. Doping is all around us on every level. Please set aside the arguments and overused statements of how doping exists in all sports, how "everyone does it," or that only athletes who stand on podiums use drugs. Being a seemingly nice person, does not equate to fair sportsmanship. Unless the rules say all can dope, it is cheating. Truth #4: This is a bummer! The tires were deflated for many specific fans of pro cycling today. On this sad morning, I don't want to talk about a cleaner sport. It is insulting to think we would so easily refocus our attention on the return after injury of Peter Stetina or Taylor Phinney. Two men at the Tour of Utah, who would rightly want to earn their race coverage from a different angle. I want to acknowledge how sad today's headline was: not for Tommy D, not for the team, but for the fans who believed that racing clean was possible. Truth #5: There are a lot of really sad Cannondale-Garmin fans today. Fans have stood by this team for years, even with recent poor performances. The Argyle Regatta was their team, a team they could believe in. When the world of pro cycling looked bleak, their team was "clean," different from the harsh world of doping reality. Every man on the Cannondale-Garmin team stood for principal of fair sport, until today. Said one friend, "I'm just so disgusted with Tommy D. This stupid sport." Truth #6: Danielson is a drop in the bucket. Nobody really cares about Tom Danielson anyway (other than all those STRAVA 2nd place record holders). If Danielson sticks by his denial of, "I would never," I hope he at least feels bad for every rider on his team Cannondale-Garmin in Utah, Colorado and Spain, in coming weeks who will have to answer questions about doping because of him. I hope the team stands by each current racer on its squad, for they are not to be blamed for Danielson's decisions, or for this flimsy clean team marketing ploy. Team management of Cannondale-Garmin changed in recent years. Much of the determination to do things differently - and take the clean road - came from the strong will of Jonathan Vaughters, a man guilty of doping himself, who has made a nice living off of the sport and spent many hours in recent years earning a MBA. Hands on management is everything, especially in cycling, where new sponsors come on board and begin to stress business norms and expectations. Sure teams are pressed to have results, but I believe the decision to dope is the individual's responsibility, yet also a sign of poor management. Truth #8: Deceit is the worst of human traits. The higher you stand the further you fall. I never wish any badness to befall anyone. Yet, deceiving others is crap, plain and simple. I feel bad for every fan who believed, every racer robbed of a stage win, every rider not signed to the team because of Tom Danielson's salary, every child who looked into Danielson's eyes and believed him, even for that one autograph or one second on TV. 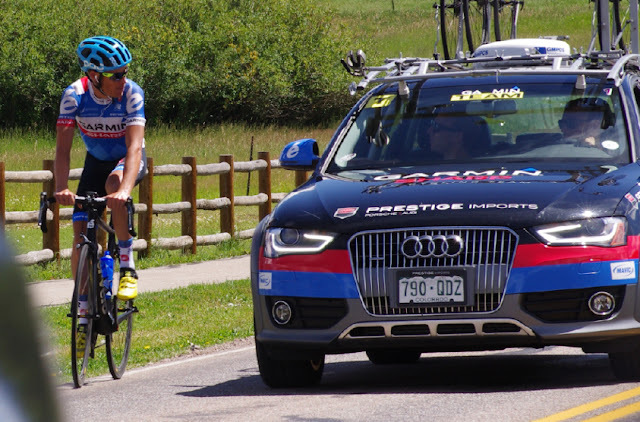 Tom Danielson cheated, in the past, and in the present. Truth #9: Never base truth or your moral compass on business managers, journalists or social media. Social Media - is a balance of popularity seeking individuals and a gauge of disgust, only for those who already follow set individuals. Within three hours of this morning's news in America, journalists hadalready advanced through the 5-steps of doping journalism. Meanwhile fans were trying to figure out why "people" were or were not so upset about this latest doping report. Expected news of the guilty party withdrawing from the Tour of Utah left journalists concerned with readership for the race after day one, and a few exasperated fans throwing up their hands in defeat and disgust. Truth #10: Yes, I follow cycling, no, I don't like Lance Armstrong ... or Tom Danielson. The health of professional cycling stood deep in the grave after Lance Armstrong started digging. Then Armstrong handed shovels to George Hincapie, Tyler Hamilton, Christian VandeVelde, Dave Zabriskie, Tom Danielson, Chris Horner, Jonathan Vaughters, and so many more. Those of us who had watched the sport for years, remarked how deep the hole had become, but we stayed fans. Meanwhile cycling became a joke sport to many casual followers in the broader community. Cycling became a fantastic sport to do, but an embarrassing one to follow as a fan. Truth #11: Things will not change. No, this is not the straw that broke the camel's back. This is just one doping report of many. The Cannondale-Garmin team will go on, Vaughters will likely make a public statement of apology and how they plan to have tighter controls. Sponsors will stay, press conferences will be handled with the correct terminology, Sample Bs will be completed and a life ban will be in place so that Tom Danielson will never race again. Danielson's cycling lodge in Arizona will continue, he will be an admired guest at cycling event rides. Who knows, he might become team staff, an announcer, a journalist. He "love's cycling" so I am sure somebody will pay Tommy D for his years of dedication to the sport. Nothing will change. Except someone else will get Tom Danielson's team salary and someone else will win that stage that this cheater would have won if his A Sample had not stopped him short. The best news is that I will not have to write his name while reporting on the upcoming USA Pro Challenge. Thank you for that USADA! Tommy D and Vaughters spent a lot of time together over the years. Truth #12: This is a perfect opportunity for new team kit and colors! Selfishly, Id like to disappear, but that hurts quite a few good people. Therefore,Slipstream's owners(me too) have decided to push forward. I had to read that three times because I could not believe these were his first, and only, words on the matter. Of course he does not plan to fire himself, he thinks it would not be fair to the "few good people" who love him. Lessons of the day: MBA school, leadership training - not worth the money. Doping pays! Sport is not a character builder but a character revealer.